Presumably, a ship’s captain will know the local time when he leaves port. If that port is London, so much the better, since the Royal Navy used the observatory at Greenwich as its reference point for measuring longitude. However, local time changes as one moves across longitude lines (Thus, the reason for time zones). If there were some way of bringing along Greenwich Mean Time, and comparing it to local time, one’s longitude can be calculated. Unfortunately, the clocks of the time were nowhere near accurate enough when subjected to the roll of a ship, temperature extremes, and salt air. Many ideas were proposed. Some worked well in theory, such as observing the positions of Jupiter’s brightest four moons through a telescope and comparing against an almanac—not easily done on the pitching deck of a sailing ship. Others were more practical, but not accurate enough, such as measuring the distance and angle of Earth’s moon in the sky versus a bright star. 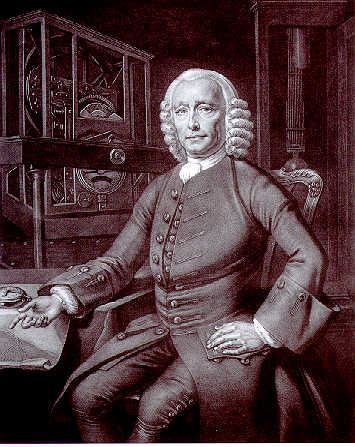 John Harrison, a self-taught clockmaker, thought he could improve the accuracy of mechanical clocks. 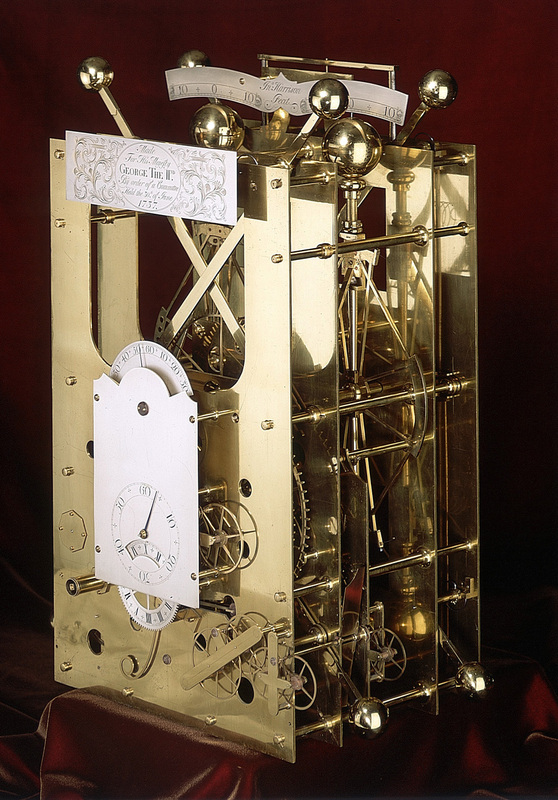 He dedicated his life building a series of five marine chronometers, each one more advanced than the last. These timepieces were designed so that each source of error could be cancelled out. For example, temperature changes caused thermal expansion or contraction of the springs; Harrison cancelled it out by incorporating a temperature-sensitive bimetallic strip. He also devised mechanisms that were not affected by the movement of the ship. John Harrison (ca. 1768) His H-4 chronometer is on the table by his right hand. The culmination of this technological advance was the “Sea Watch”, a chronometer in a five inch diameter case, which Harrison finished in 1761. (The Harrison chronometers are generally denoted H-1 to H-4, the Sea Watch being the last.) H-4 underwent extensive trials by the Royal Navy and was proven to pass the standards required. Although there is ample evidence of some bias against Harrison on the part of the Longitude Board, (and Harrison had to request the assistance of King George III to prompt Parliament to act), he was eventually awarded a total of £23,065 for his chronograph. When I visited London back in 1998, I had a free afternoon and a choice between Kew Gardens and Greenwich. I chose Greenwich but unfortunately arrived just as the museum closed. So I missed out seeing the Harrison clocks that time. When we visited again a few years ago, I made it a requirement that we visit Greenwich again. The Time and Longitude Gallery was not a disappointment. Unfortunately, I seem to have been so awed that I didn’t take any pictures of the Harrison clocks, so we’ll have to do with the photos provided by the Maritime Museum on its website. The chronometers are interesting to look at. Their almost incomprehensible gear trains and escapements definitely engage my scientific side, and all the brass fiddly bits appeal to my love of overly complex steampunk gadgetry. But what I find very interesting is that something so utilitarian as a marine chronometer, and essentially a prototype at that, should be crafted so beautifully. 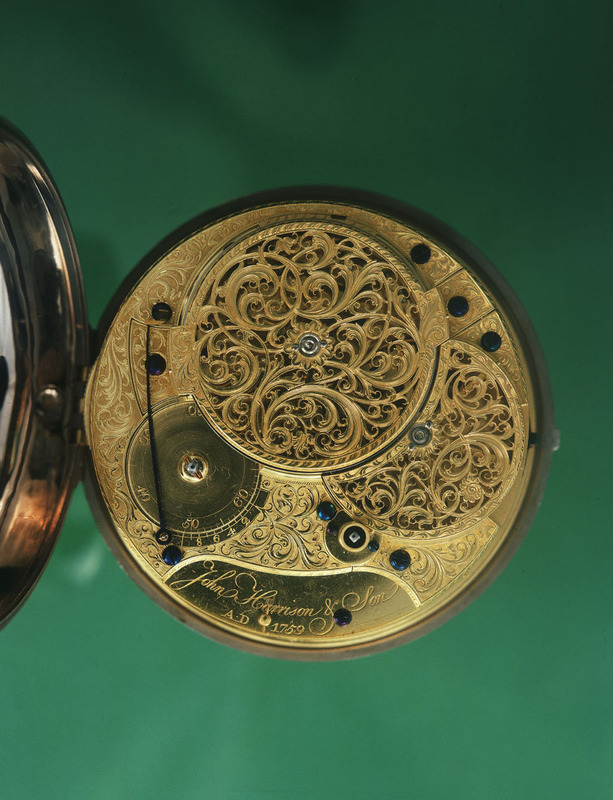 Just look at the beautiful tracery on the back side of the movement of Harrison’s H-4, and remember that hardly anyone would even see the movement when the chronometer was in its case. John Harrison’s signature at the bottom is a testimonial to the man who spent his life improving the accuracy of timekeeping. Harrison’s H-4, the back of the movement. To learn more about John Harrison and his quest to accurately measure time, there’s a link to a BBC documentary on the Two Nerdy History Girls link. Dava Sobel’s superb book Longitude is eclipsed only by The Illustrated Longitude which contains a plethora of photographs and diagrams. A television mini-series was also made from the book, starring Michael “Dumbledore” Gambon as John Harrison. This entry was posted in History, Science, Steampunk and tagged history, science, steampunk by mjtierney1. Bookmark the permalink. Since Google has honoured John Harrison with the Google Doodle today, I thought I’d repost this blog post from almost five years ago.